Solid cross-platform software that is easy to use, powerful and manages to stay under $100. What more do you need? Currently clocking at 59 Euro (roughly about $77.75 for version 2.5), energyXT is a lofty contender for the budget DAW market. I was dreaming of a day when one could just purchase a DAW and have it work on any OS and apparently the guys at energyXT did as well. The software runs on Windows OS, Mac and Linux! That in itself is a huge feat, but how do they stack up against the competition? Throughout my run with energyXT I can not say for once that it felt like a cheap imitation of the big boys. My experience with this DAW is that it is stable, feature-laden and simple to operate and in some cases it is more fun to work with than its bigger and more expensive counterparts. Installing energyXT is very straightforward. After a minute I was up and running. I installed on my aging G4 Mac iBook so I can compare it with Windows. On an older machine the install was also very fast and start times were faster than my old Cubase LE 1. I didn't have a Linux system to try at the time, but judging by energyXT's forums, response from the Linux crowd has been very enthusiastic so I would suggest that you head over there for more info on Linux support. EnergyXT comes with a digital mixer, with unlimited channels of audio, midi, fx returns and subgroups. It has a virtual effects rack which lets you string vst plugins in an effects chain. EnergyXT also comes with built-in effects, such as EQ, reverb, chorus, guitar amp simulator, and more. Included are also virtual instruments (synthesizers and drum sampler), mp3 support, time stretching tools, drag and drop operation, clip library, automatic beat slicing and audio processing functions such as normalize, delete, trim, fade in/out, and reverse. 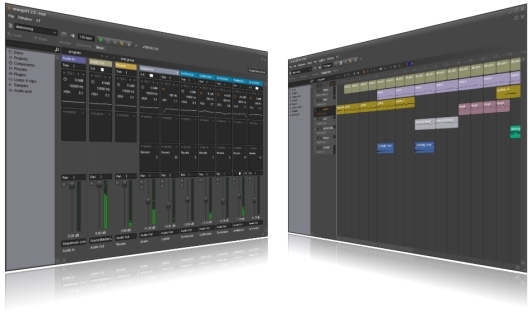 The program consists of three main windows: Modular, Sequencer and Mixer. Modular shows all the connections into the software, both midi and audio. New components could be added by dragging them from the browser window on the left to the Modular screen and the view is somewhat similar to a patchbay in a traditional mixer. Sequencer shows the tracks in a horizontal layout format and this is the window where most of the edits are performed, arrangements moved, fades and fx automation curves drawn and so on. The Mixer window looks like a traditional analog mixer where levels could be controlled, effects added, routing changed and so on. On startup energyXT loads a start screen prompt which lets the user pick from an already premade template, access recent project files or start a new one from scratch. One of the biggest surprises was the load time. The program has probably one of the shortest load times I've seen! To test energyXT's mixing capabilities, I loaded some of my raw audio files and proceeded to build a mix as well as add a few extra parts. I could get started right away but felt the program's look was on the dark side. No problem - energyXT has skinning capabilities and I managed to change to a lighter look by picking another color scheme. It was a breeze! For the most part everything is where I'd expected it to be and in look and feel is somewhat similar to Ableton Live, with a browser window on the left which lets the user access most of the program functions. The menu screens are on the top and that is where you create changes in the arrangement sequence, perform track functions, or perform changes to the loops within the parts. After a few hours of work, energyXT felt very natural and it had a small learning curve which was well supplemented by their tutorials and online videos, all available from their website. The biggest surprise to me was the excellent synths and drum sample, which alone are worth the price of the software. The drum sampler managed to load my custom wav samples which I use on Battery 3 and within a few minutes I had a great sounding drum track. Fades are also very easy to do - pretty much as other software, energyXT lets you record fades in real time or draw them on the screen. The built-in effects are very good and easy to work with, something that can rarely be said about plug-ins in this price range. I had some issues with the Guitar Amp guitar modeling plug-in refusing to load the Dirty (high gain distortion) settings and it was never resolved, but I quickly supplemented with freeware guitar sims. Another strange thing I experienced was when picking a new audio track to record onto. The track created went to stereo by default and had to be forced to set to mono. This quirk had me hunting for menus and tutorials until I discovered that the option appears in the Object bar (Options->Object Bar). Once I discovered how to do it it wasn't a big issue but finding the settings had me in a panic for a while. Tracking with the software was a breeze as was mixing down to stereo file. Mix down to mp3 is also included, which comes in rather handy as you can do all music production and sound prep for the web by never leaving EnergyXT. With energyXT you get a lot for your buck. It is an intuitive, user friendly, cross-platform recording app that has everything that a musician/producer would need to complete a project from start to finish. It sounds great and it is easy on the budget. What more could you ask for?